Do you have an insane amount of Thanksgiving leftovers like I do? Since we had David's family here from out of town, all the leftovers stayed in our fridge. I'm certainly not complaining (cause hello - deliciousness for dayzzz!) but I've had to get creative with them. So, this week's menu includes an implementation of a few things... like, I'm using the copious amount of leftover turkey to put in a turkey noodle soup (with yummy homemade noodles) and the huge container of mashed potatoes is going underneath some delicious, hearty stew (side note: I first had stew like this in Ireland and have been hooked ever since! Anyone do this?). Love your blog! Am I missing you posting your recipes for your weekly menu somewhere? Would really like them :) Hope you have a wonderful day! Hi Noni, are you referring to previous weekly menus? If so, I'm trying to figure out a way to get them all together in one spot. In the mean time, you can type in "weekly menu" in the search bar on the right column (scroll down a bit) and find them there. Hope that helps! 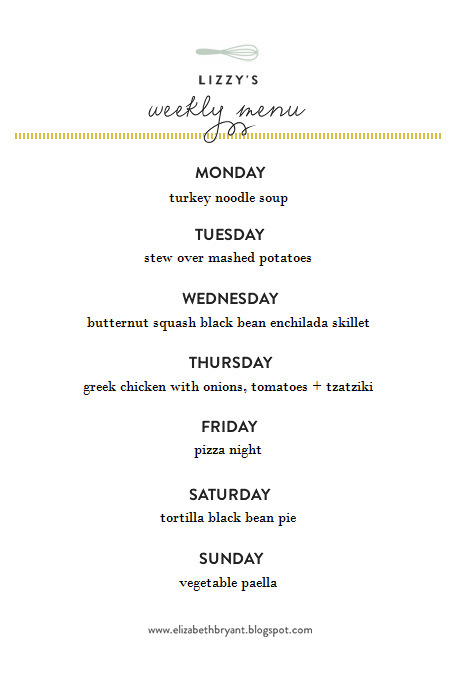 I enjoy your weekly menus so much--they sound delicious. You are inspiring me to prepare very healthy meals, which I like to do as my husband is battling stage 4 colon cancer. I've shared your menus with a few other wives at the infusion center (chemo center). I hope you can post recipes sometime, although I've been able to find recipes online, I'd be interested in your version.